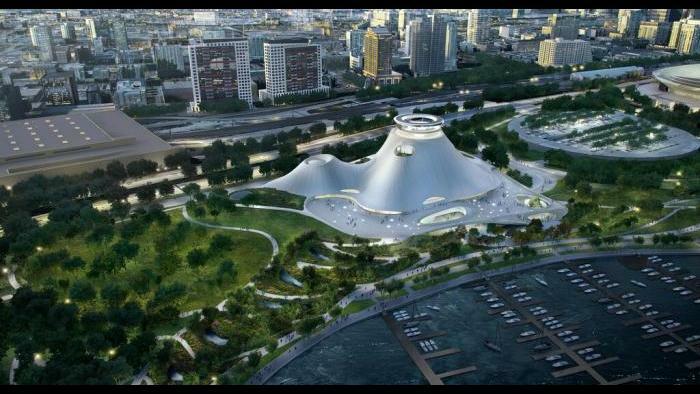 Friends of the Parks, the nonprofit organization seeking to block the proposed Lucas Museum of Narrative Art, has again argued its case for why the museum from film mogul George Lucas should not be built along the city’s lakefront. Until recently, it looked like the museum – which would take up 17 acres along the city’s lakefront, just south of Soldier Field – was a done deal. Over the past several months, plans for the museum quickly passed through the Plan Commission, Chicago Park District and City Council, where the project met with little resistance. But the museum has simultaneously faced a lawsuit from the local preservation nonprofit organization, which claims both the city and Park District are out of line in agreeing to lease the land to a private company. Last month, rather than tossing out the lawsuit, a federal judge gave Friends of the Parks three weeks to respond to the city’s motion to dismiss the case. In its response, filed Thursday in federal court, Friends of the Parks reiterates its argument, stating that the lease agreement between the city and the museum inherently violates the public trust law, which states that lakefront land should be preserved and protected for residents. Because the Park District owns the proposed Lucas Museum land – currently a Soldier Field parking lot used mainly by Chicago Bears tailgaters – the museum would technically lease that space from the district for 99 years at a cost of $10, with a two-time option to renew. Friends of the Parks argues that, in leasing the land for that length of time, the park district has completely given up ownership of the Lucas Museum site. The group also argues that the lease agreement is a one-sided deal which greatly profits the Lucas Museum with no clear-cut benefits for the city or park district. Friends of the Parks also takes issue with a state law passed earlier this year, which basically gives all Illinois park districts the right to determine what serves the public trust. “It has left it up not to just to the Chicago Park District, but any park district, to sell off or give away for free any 'submerged land' –by three successive 99-year leases–to any private party, under any degree of operating control, for any kind of private gain, for anything that a park district wishes to deem a 'museum,' a term that has no real definition,” the response states. Plans for the futuristic-looking museum, designed by architect Ma Yansong, include a library, gallery and several theaters, in addition to 4.6 acres of publically accessible parkland, with landscape design from Chicago architect Jeanne Gang. The city still has to file its formal reply to Friends of the Parks’ response, with federal Judge John Darrah ultimately making a final ruling Feb. 4.